New American Chemical Society Fellows (from left) David Martin, Karl Booksh and George Luther. 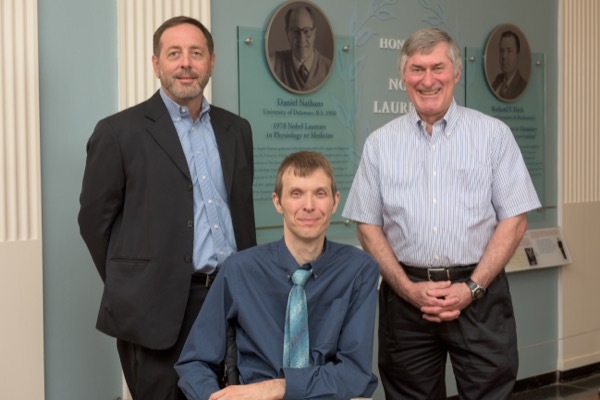 10:30 a.m., July 13, 2015--The American Chemical Society, the world’s largest scientific society, has named three University of Delaware professors  Karl Booksh, George W. Luther, III, and David C. Martin  to its 2015 Class of Fellows. Started in 2009, the ACS Fellows program recognizes members for outstanding achievements in and contributions to science, the profession and ACS. The 2015 Class of Fellows includes 78 scientists and engineers from academia, industry, government labs and small business. Fewer than 1,000 of the society’s nearly 158,000 members have been distinguished with this honor, placing Booksh, Luther and Martin among the top one percent of their peers. They will be recognized during the society’s national meeting in Boston on Aug. 17. Karl Booksh, professor of analytical chemistry in the Department of Chemistry and Biochemistry, which is housed in UD’s College of Arts and Sciences, specializes in developing in-situ chemical sensors to monitor environmental, biomedical and industrial processes. In addition to research, Booksh is passionate about preparing students with disabilities to become leaders in science, technology, engineering and mathematics (STEM). He has served as chair of the ACS Chemists with Disabilities group and previously served on the National Science Foundation Committee on Equal Opportunities in Science and Engineering. At UD, Booksh founded the Chemical Sciences Leadership Initiative, which brings undergraduates from across the country to campus annually to gain practical experience as research assistants working with UD professors. Booksh earned a doctoral degree from the University of Washington, Seattle and a bachelor of science degree from the University of Alaska, Fairbanks. He joined the UD faculty in 2006. George W. Luther, III, is the Maxwell P. and Mildred H. Harrington Professor of Marine Studies in the School of Marine Science and Policy, which is housed in UD’s College of Earth, Ocean, and Environment. He holds joint appointments in UD’s departments of Chemistry and Biochemistry, Civil and Environmental Engineering, and Plant and Soil Sciences. Active in ACS since 1969, Luther has served as chair of the North Jersey Local Section and the Division of Geochemistry, and has served as an ACS councilor and alternate councilor, and on several council, local section and division committees. He is the editor-in-chief of Aquatic Geochemistry. He is a fellow of the American Association for the Advancement of Science and the American Geophysical Union. He is a recipient of the Geochemical Society’s Clair C. Patterson Award, the ACS Division of Geochemistry Medal and UD’s highest faculty honor, the Francis Alison Award. David C. Martin joined the UD faculty in 2009 as the Karl W. and Renate Böer Professor of Materials Science and Engineering. He has a joint appointment in biomedical engineering. Martin’s research focuses on high resolution transmission and low voltage electron microscopy studies of defects in polymers and organic molecular crystals. His expertise lies in the molecular design, synthesis and characterization of electrically active polymers. These materials are of interest for a wide-range of applications including biomedical devices and sensors, thin-film transistors and light-emitting diodes. The long-term goal of his work is to improve the performance of bionic devices that are directly integrated into the body. Examples of these include cochlear implants to restore hearing, retinal implants to restore vision and next-generation limb prosthetics. Martin served as president of the Polymeric Materials Science and Engineering division of ACS. He is a fellow of the American Physical Society’s Division of Polymer Physics and the American Institute for Medical and Biological Engineering. Martin earned his doctoral degree in polymer science and engineering from the University of Massachusetts at Amherst. Previous UD faculty members to named ACS fellows include Herbert Allen, Eric Furst, Kristi Kiick, Michael Klein and E. Terry Papoutsakis.